1 Võro and Seto in southern counties are spoken along with Estonian. 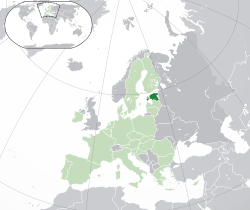 Russian is spoken in Ida-Virumaa and Tallinn, due to the Soviet program promoting mass immigration of urban industrial workers from the USSR in the post-war period. are nowadays part of Russia. 3 .eu is also shared with other member states of the European Union. Эн халхин отхн сольсн: 21:27, 14 Ноха сарин 2017.